Heads up kids and not so kids anymore! It looks like the word is out! For the whole month of October (Weekends for the Diner) Trinoma is giving you a treat! They probably know that Halloween is just around the corner and since they've been holding the Choose Your Own Food Adventure call all this month, they're letting you experience a full blown Zombie Outbreak Diner and the oh so cute PAWS Pet Cafe too! 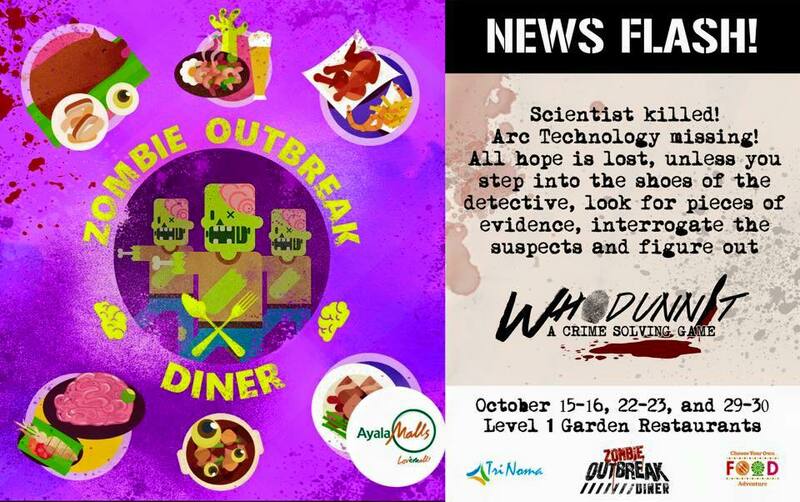 The Zombie Outbreak Diner is located at the Garden Area right beside the fountain in the front entrance of the mall. Just go right after the guards and you'll see it there. Now this ain't your ordinary diner of course because it's going to be a whole different experience if you need to PLAY while you're having lunch or dinner. The experience of being in the story was pretty interesting because this is a case of WHODUNNIT (A Crime Solving Game) and you might also get the chance to win prizes! Here's what happened during the launch! Aside from this awesome dining experience, they've also got those cute little dogs and cats from Philippine Animal Welfare Society that put up their own kiosk at the third floor of the same mall. You basically just order coffee, get cat food or dog treats, then get to have tea or coffee with your friends and these lovely little furballs! Oh I just want to take them all home! Thank you TRINOMA and Ayala Malls for having us! Super loved being there earlier!